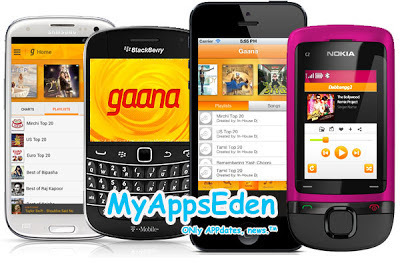 Gaana.com, Times Internet Limited's on-demand music streaming destination, releases apps simultaneously for Android, BlackBerry, iPhone and Java platforms. Ganna app allows you to create music playlists the songs you like, share it with your friends, listen to online radio and makes music discovery fun. Gaana has an extensive music collection of over 1 million songs across nearly 100 genres. Listen to free music online on Gaana.com. Find the latest songs, search for your favourite artists and albums, build your library and discover music. Gaana's Java app works on Nokia (Asha OS S40 6th edition & above and S60 3rd edition & above) and Samsung (running OS Bada 2.0 as well as Samsung's own proprietary OS). BlackBerry Supported Devices List: Curve 8520, Curve 9300, Curve 9330, Torch 9800, Torch 9550, Curve 9380, Curve 8900, Curve 9350, Curve 9360, Curve 9370, Bold 9790, Tour 9630, Bold 9650, Bold 9700, Bold 9780. Click And Download Free Apps.